Use the Destination Preferences Window to configure how MessageSave pre-fills the Where to save field when you open the Save Messages Window. 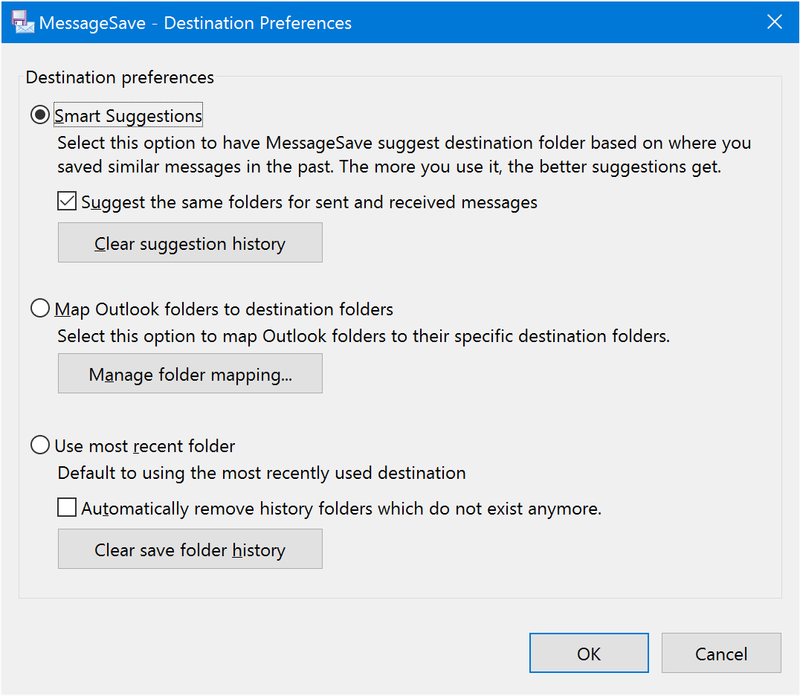 MessageSave will suggest destination folder based on where you saved similar messages in the past. It will learn where you file messages based on various message attributes, such as sender, recipients, subject, etc. If you have been using our SimplyFile product, you know how powerful folder suggestions are. With SimplyFile, you simply click a button to file a message in the right Outlook folder, instead of using tedious and error-prone drag and drop. We have integrated the same folder suggestion algorithm that powers SimplyFile into MessageSave. Instead of suggesting an Outlook destination folder, like in SimplyFile, MessageSave suggests file system destination folders. Use this option if you always select destination folders based on which Outlook folder the message is located in. Every time you save a message from a particular Outlook folder, MessageSave will use the corresponding Destination Folder. The first time you save a message from a particular Outlook folder, you will see “<Click Browse above to select Destination Folder>” in the destination folder field. After you save one message, MessageSave will remember your mapping and use it for the future save operations. MessageSave will always default the Where to save field to the folder you used most recently. This was the default behavior of MessageSave 4 and older versions. Removes the learning history accumulated by the Smart Suggestions mode. Opens the Mapped Folders Window where you can map Outlook folders to Destination folders. If you enable this Option, MessageSave will remove folders, which do not exist, from the Where to save drop-down. Remove all folders from the Where to save drop-down.